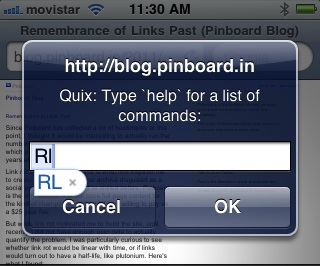 Problem: My command for the Instapaper Read Later bookmarklet in Quix is rl. Since rl is not a word, damn autocorrect would change it unless I clicked the bubble. Solution: Add RL as Instapaper’s Nickname in your contact, and now autocorrect even suggest it! I already had an Instapaper contact so I could remember my account email address when I forward articles and such (the second address is for my Dad’s account).